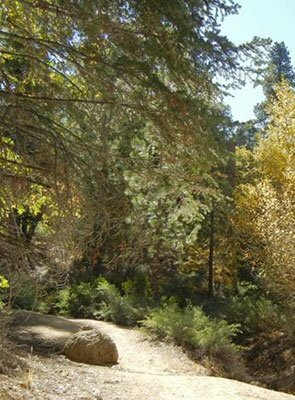 Discover the beauty of the San Bernardino Mountains on the Pine Knot hiking trail, on a picnic at Aspen Glen, or on a horseback ride on the Pacific Crest Trail. 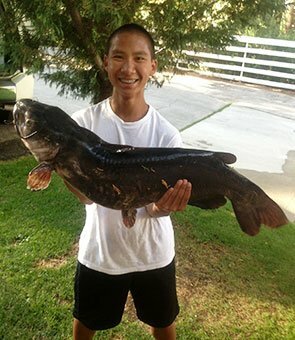 Catch a trophy fish in Big Bear Lake in summer or ski the slopes in winter. 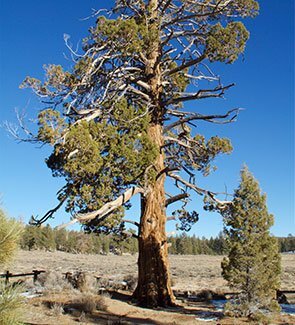 Big Bear, California offers year-round outdoor adventures. The Open Air Big Bear website provides a complete calendar, resource guide and blog for competitive events, hiking, canoeing, kayaking, snowshoeing, stand-up paddle boarding, mountain biking, road cycling, trail running, rock climbing, altitude training, camping, lodging, gear, cool places to eat and hang out…. 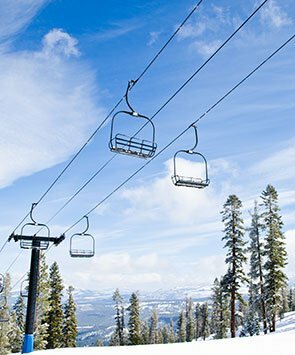 basically everything you need to know to get out and experience outdoor Big Bear regardless of your level of ability, age or interest. There are 10 popular hikes featured in the local Visitors Guide. My favorites are the Alpine Pedal Path, the Woodland trail, and the Pine Knot trail. I like the Alpine Pedal Path for the fantastic lake views, and because it is fairly flat. It is 5 miles round trip, but can be done in any length. Picnic at Juniper Point, or at one of the rest benches. The Woodland is a 1.5 mile loop, also easy. Pick up a pamphlet at the start, and then learn about what you are seeing at the 20 stops along the way. There are several large rock outcroppings which are fun to climb and make great photo opportunities! The Pine Knot trail starts at the Aspen Glen picnic area which is surrounded by tall pines with lots of open space for dogs and kids to play. The trail offers a small stream crossing in Spring. And a wide variety of open and closed views. It is also popular with mountain bikers, so stay on the lookout if your dog is off leash. 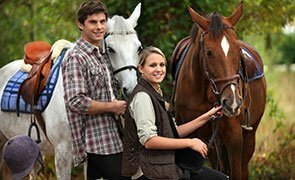 Baldwin Lake Stables provide 1,2, or 3 hour rides, plus half day rides on the Pacific Crest Trail. A wide variety of terrains and several trails are available, all with spectacular vistas. Rides are geared to the experience of the rider - available all day. Reservations suggested. Located 7 miles east of the Big Bear Village. Open year round. You can take your own four wheeler into the backwoods, or hire an off-road specialist to show you around in style. Sightseeing tours are a great way to witness the majesty that surrounds the area. Big Bear 4 X 4 tours allow you to explore the ridges, canyons, meadows, streams & rivers of the beautiful San Bernardino Mountains in a fully convertible Pinzgauer. There are a several Big Bear off road tours to choose from including sunset tours, stargazer trips, and various historic tours. One of the most popular tours is a trip back in time on the Holcomb Valley Gold Rush Expedition to learn about Big Bear’s rich history. This tour takes you on the Gold Fever Trail and makes stops at old gold mining sites that are scattered throughout Holcomb Valley. 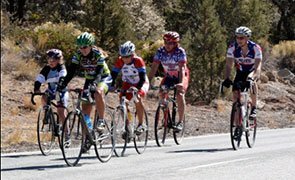 Big Bear Valley is one of the finest cycling areas in all of California. Enjoy the beautiful mountain views, 330 days of sunshine, and clear, cool weather! You will find options for road, mountain, or cycle-cross riding. The best website for information is the Big Bear Cycling Association. For information on trails from the chair lift, go to Snow Summit Adventure Park. 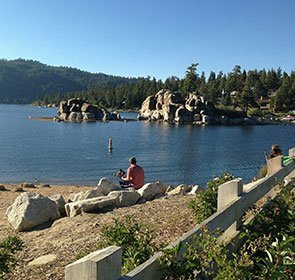 Big Bear Lake is known for great trout and bass fishing. You can shore fish, rent a boat for deep water troll fishing, or fish from a public pier. Our guests get 10-20% off on boat rentals with Big Bear Marina. You will have the most fun with a charter fishing company. They supply everything you need, know the best spots to catch fish, clean your fish, and will keep you entertained. 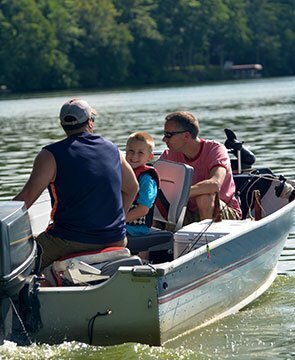 We recommend Cantrell Guide Service which has a 24 foot boat with sun and wind protection. Reservations are helpful so you get the date and time you want. Adults and children over 16 will need a license, which is $14.75 for the day, and it is only good for a specific date. You can get it at Big Bear Sporting Goods or online with the California Department of Fish and Wildlife. There is even a handy fishing report. Swim Beach has a lifeguard, sandy shore, restrooms, snack bar and picnic tables. Admission is $4 for children age 3-12, and $5 for those 13-59. It is open noon-5pm, closed Tues and Wed, and sometimes for private parties. You can also rent canoes, kayaks, and paddleboards here. Boulder Bay Park is also a good swimming spot for people and dogs! It is free, has a sandy beach, picnic tables, and a beautiful view. Kayak rentals on wheels are nearby, so you can just roll your kayak here for launching. Golfing in Big Bear is best at the 9-hole mountain course located at the base of Bear Mountain Resort. 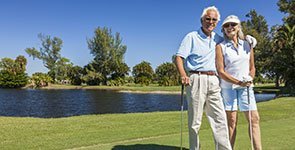 It provides a tranquil atmosphere for players of all abilities, and is complete with a pro-shop where you can rent clubs and reserve golf carts. There is also a driving range and Club House Grill. Big Bear Parasail offers parasailing and jet boat rides, as well as wave runner rentals. The New Zealand style jet boat ride is 30 minutes of thrills. Be prepared to get wet! Parasailing is an opportunity to enjoy beautiful views as you quietly float in the air. Big Bear Marina is Big Bear Lake's premier place for boat rentals, wave runner rentals, wake-boarding and skiing guides, and fishing charters. There's also a great tackle shop. Pleasure Point Marina is the oldest continually operated marina in Big Bear, which opened in 1914 as Belt's Landing. Holloway's Marina has two marinas that together host the largest variety of lake activities and watercraft available in Big Bear, so load up the coolers and bring your swimsuits! Bear Mountain Resort has over 120 jumps, more than 80 jibs, Southern California's only Superpipe, one standard halfpipe, and plenty of exclusive designs. Big Bear Mountain Resort offers professional skiing and snowboarding lessons for all ages from beginners through expert levels. Snow Summit is the ideal place to spend the day carving on picturesque, perfectly groomed, wide-open slopes. A huge variety of interconnecting runs allows skiers and snowboarders to explore the entire mountain without ever returning to the base area. Extensive snowmaking capabilities at Snow Summit means superior snow conditions throughout the season, regardless of changing weather patterns. During the summer, you can ride up the Sky Chair and take a leisurely walk around the mountain top, mountain bike through the forest or enjoy a scenic ride back to the base of the mountain. If there is natural snow, our guests are welcome to sled at Pine Knot Guest Ranch. There are several sloped areas on our 2 acre property, so you can choose a gentle slope or steep drop depending on the speed and excitement you are after! You will need to furnish your own sled. 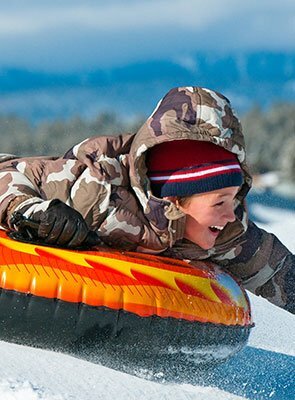 Inexpensive plastic sleds are available at many locations in Big Bear. You can also sled on forest service land. The Aspen Glen picnic area is a great location. Sledding is at your own risk. Please be aware of hazards like tree trunks, rocks, etc. Big Bear Snow Play makes snow, so it is generally open all winter starting as early as November. They have a heated Magic Carpet ride that takes you up the slope, so you won't get tired climbing up every time you tube down. You pay once to go tubing as many times as you wish. Tubes are provided. There is a cozy base lodge with refreshments and games. Night tubing is available at reduced cost on weekends in peak season.